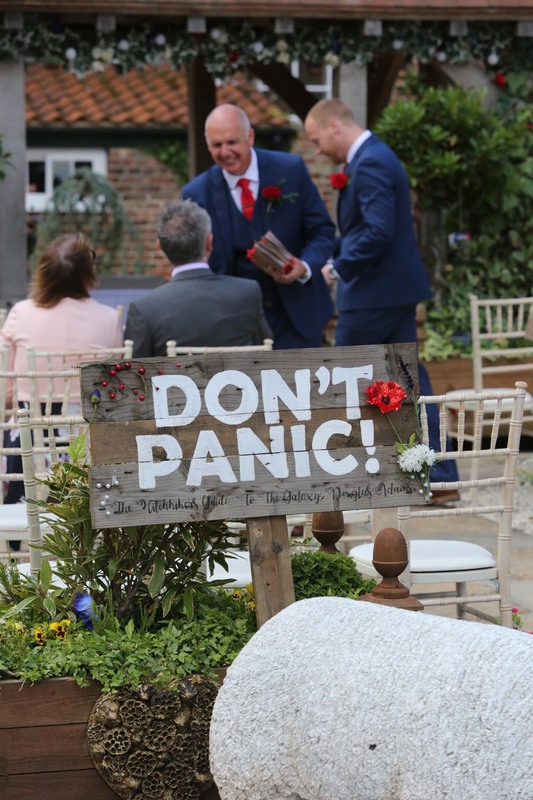 The eve of Becky and Paddy’s wedding was marked by the longest lunar eclipse of the century, and a beautiful ‘Blood Moon’ filled the night sky while our happy couple, having prepared a quiz for their loved ones, enjoyed a pre-wedding party on the front lawn with all their guests. 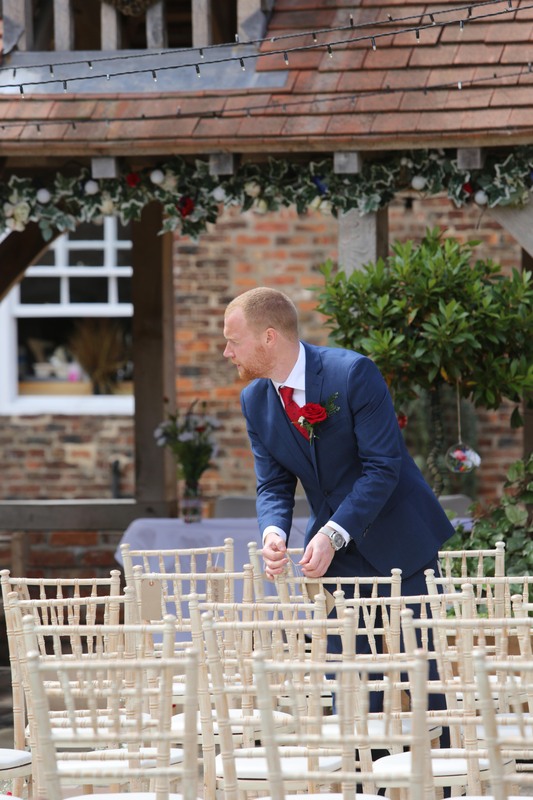 Jim, Paddy’s Best Man, had made all the garden games for everyone to play throughout the weekend. 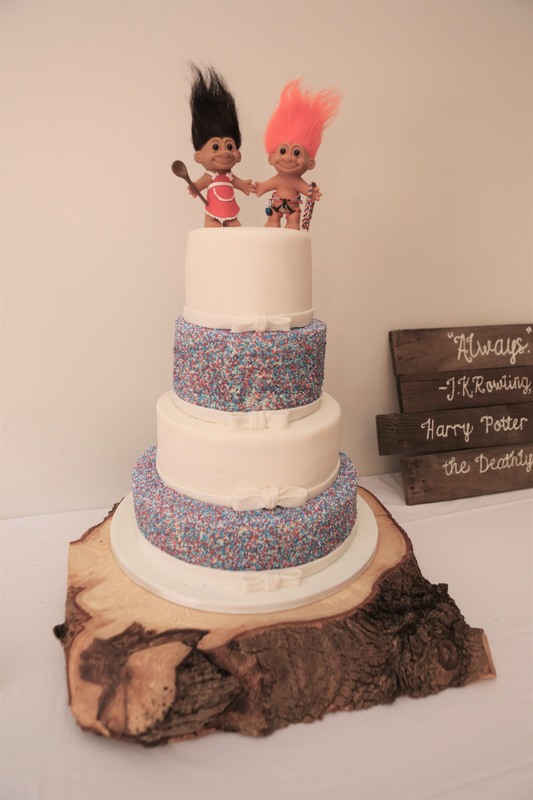 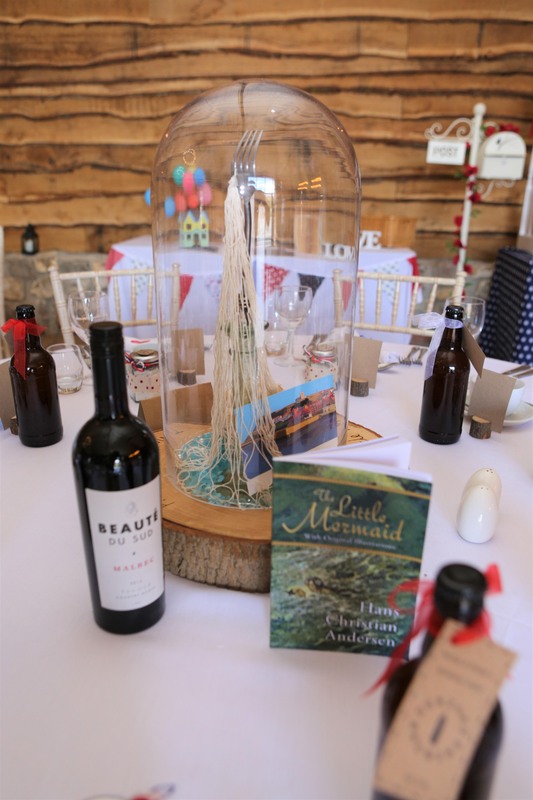 With 2 years to prepare, Paddy and Becky, both primary school teachers, made fiction books their theme for decorating their wedding day. 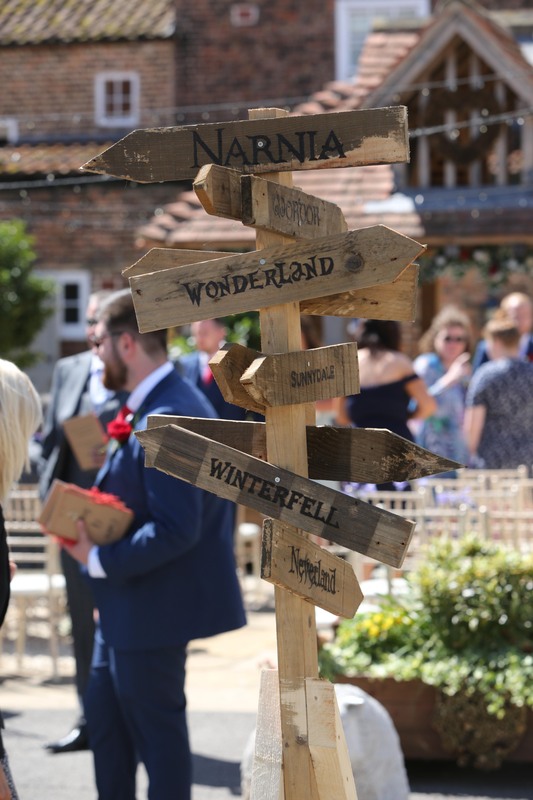 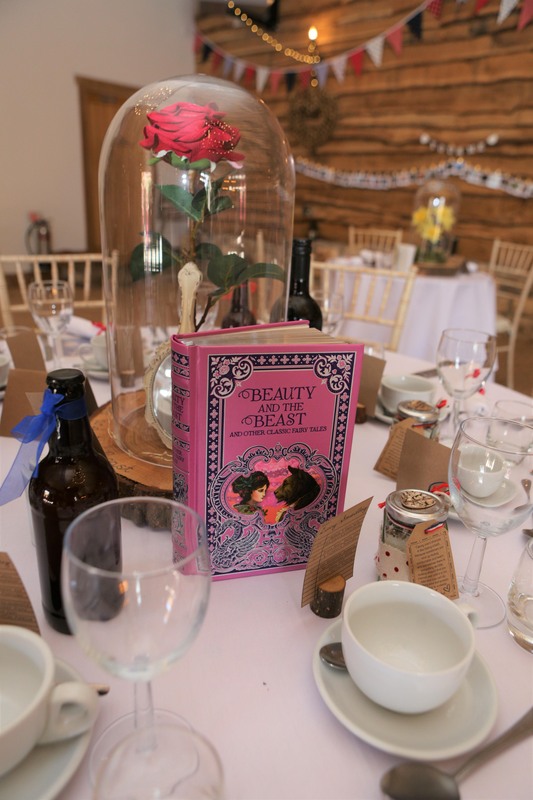 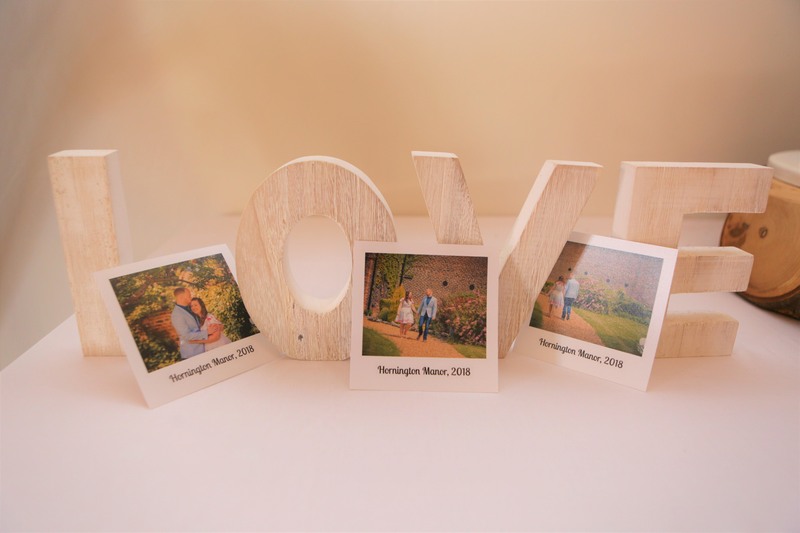 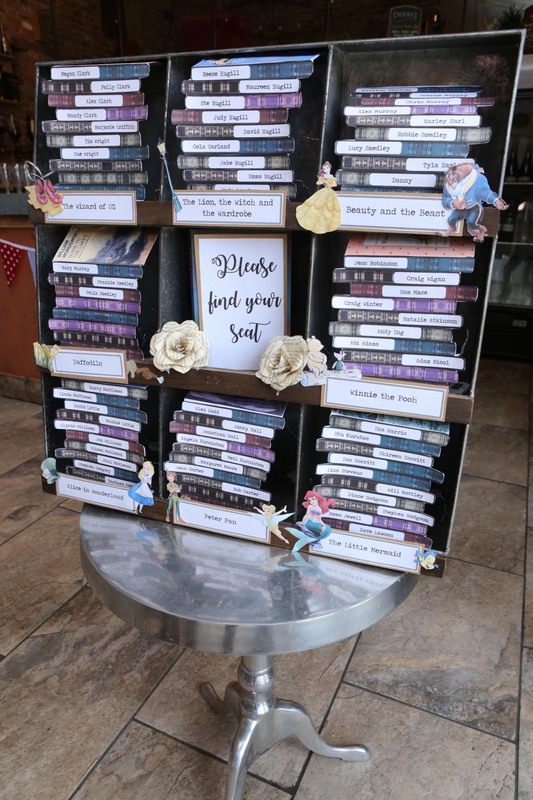 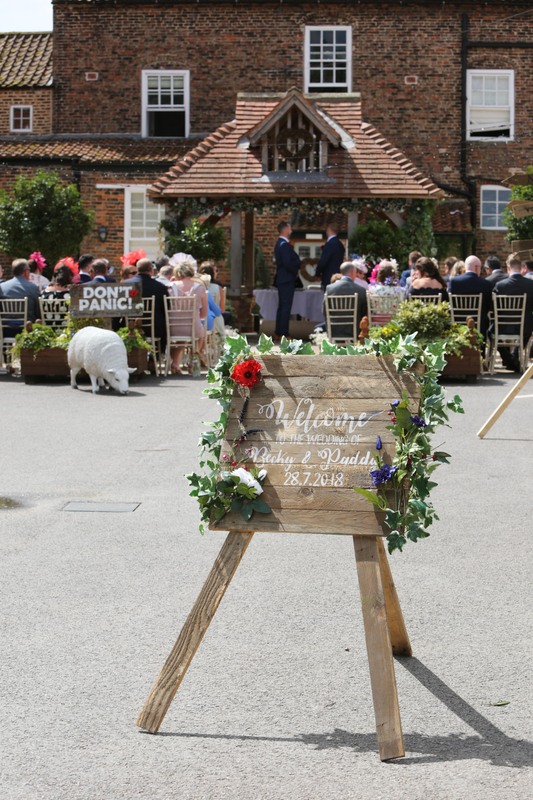 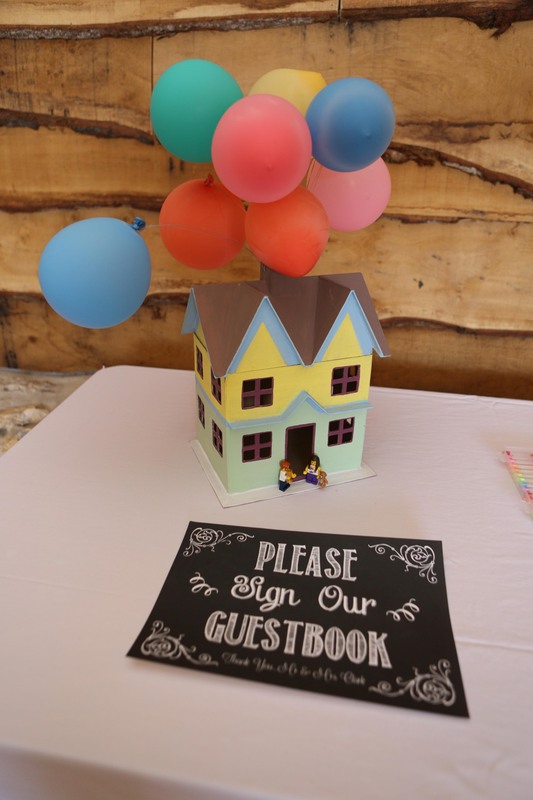 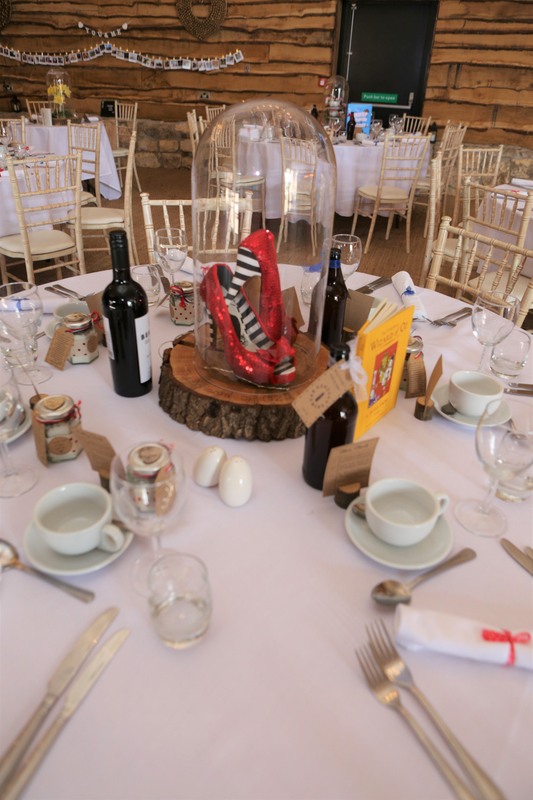 They made wonderful signs with their favourite quotes which were placed around the courtyard and wedding barn, and adorned the tables with fabulous pieces of art relating to famous literature. 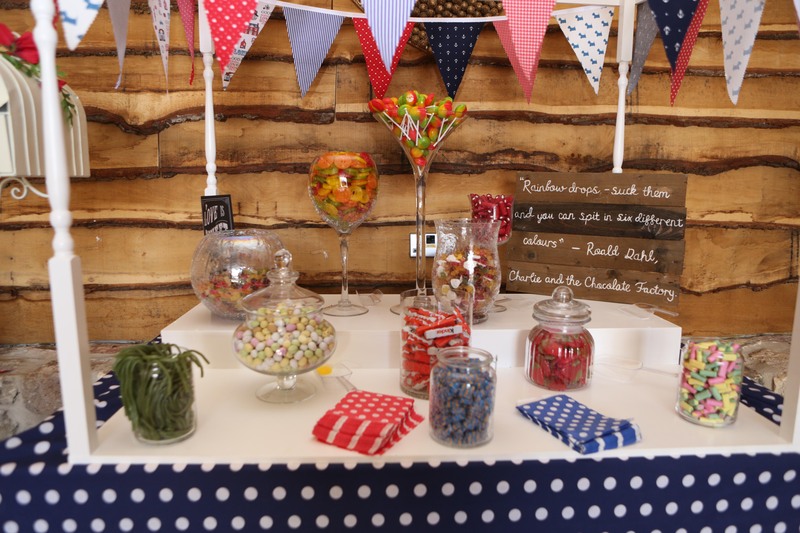 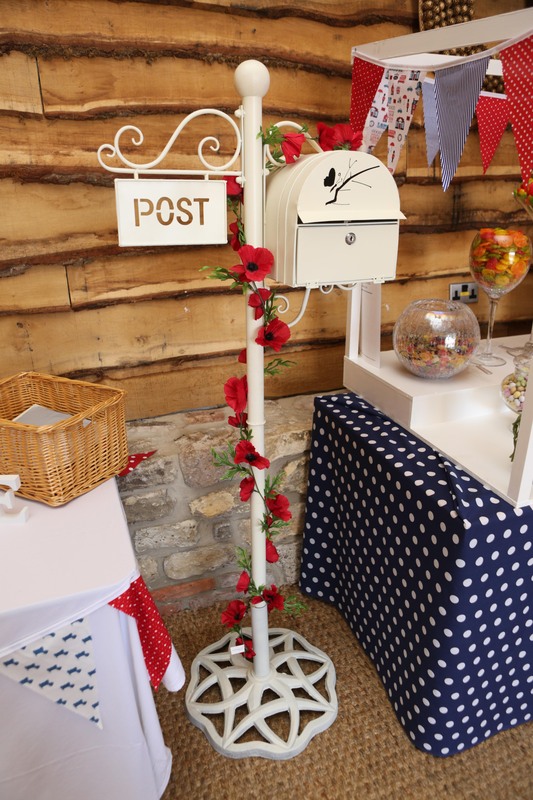 Julie’s clever handy work made all the bunting that brought the wedding barn to life, and Becky’s dad Robert had made all the wooden displays around the room, including the ever-popular sweet cart. 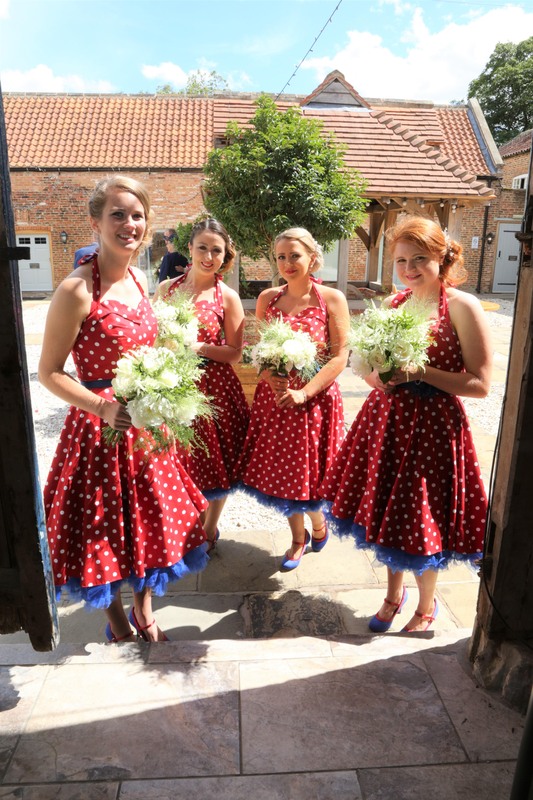 Red white and blue were definitely the colours of the day, done in style with the wonderful bridesmaids looking stunning in their dresses hand made by Becky’s mum Julie. 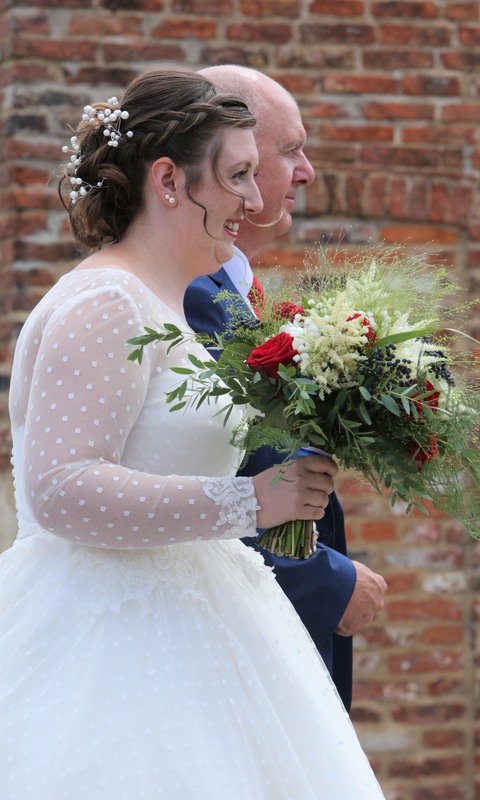 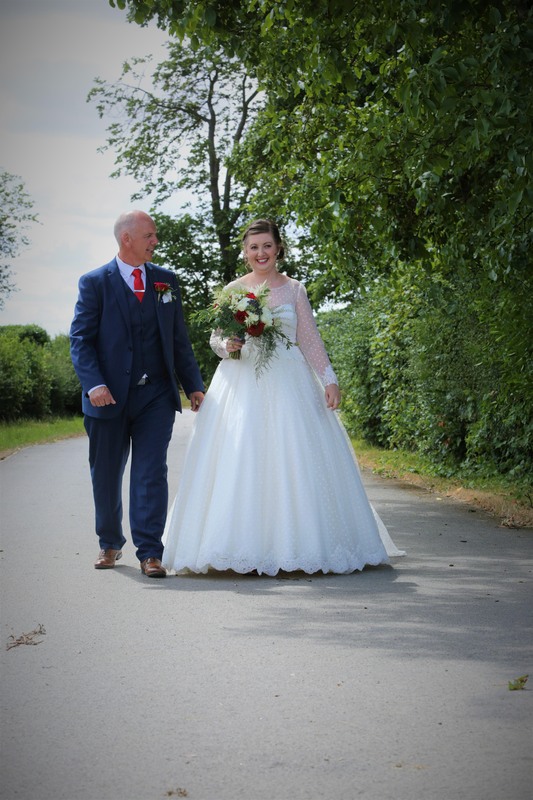 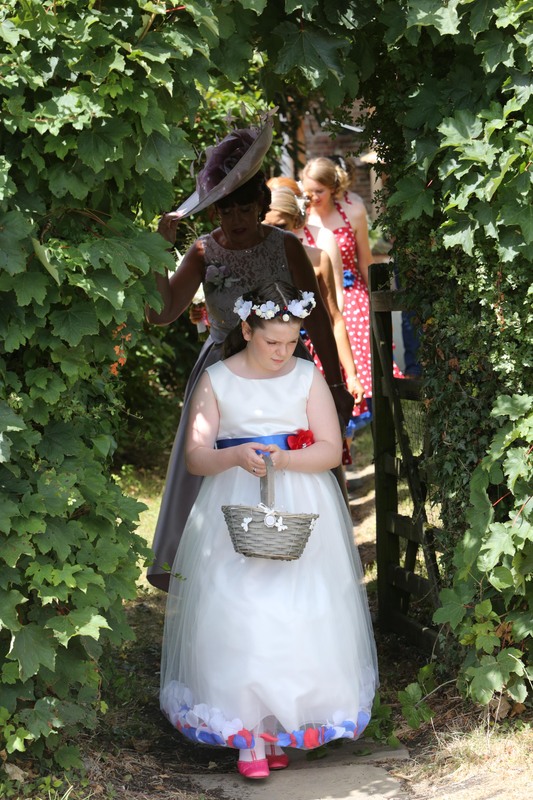 Becky was very much the fairy tale bride with her beautiful full dress with polka dot over lace, carrying a colour co-ordinated bouquet. 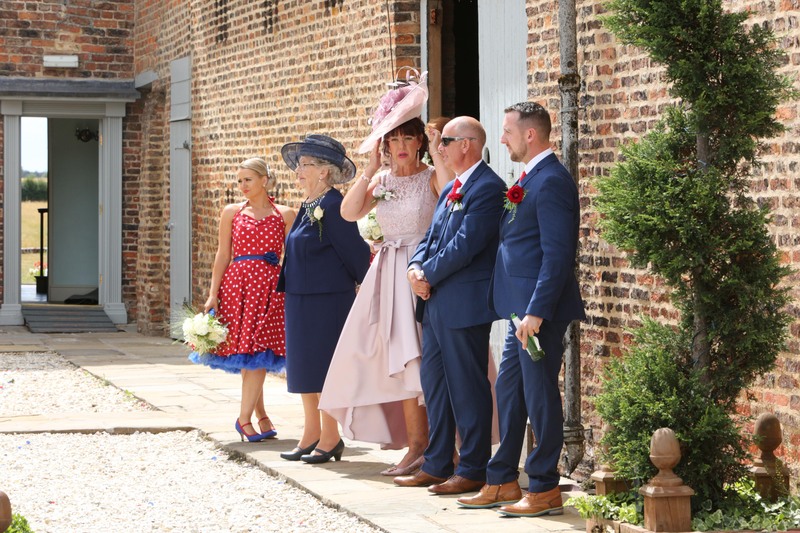 Paddy said that Becky especially liked the fact that he had named the aisle music “Walking Down the Runway”. 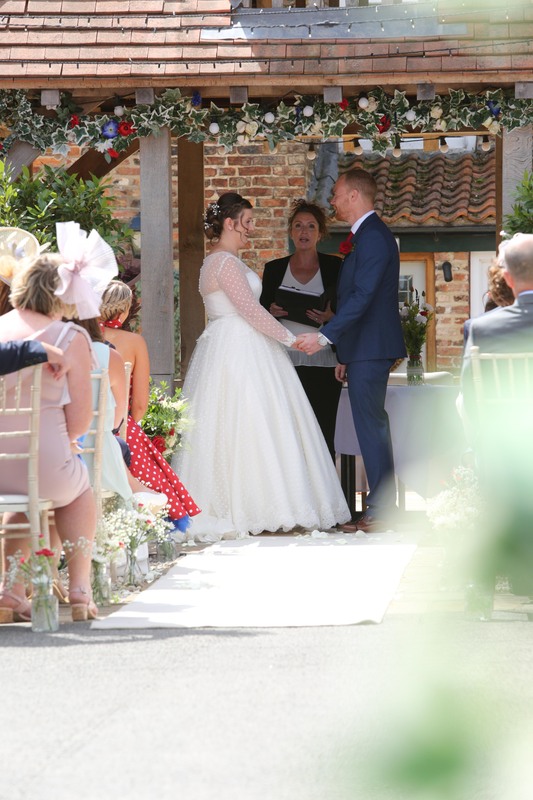 The ceremony was held under the Lych Gate and the vows the pair exchanged were just beautiful. 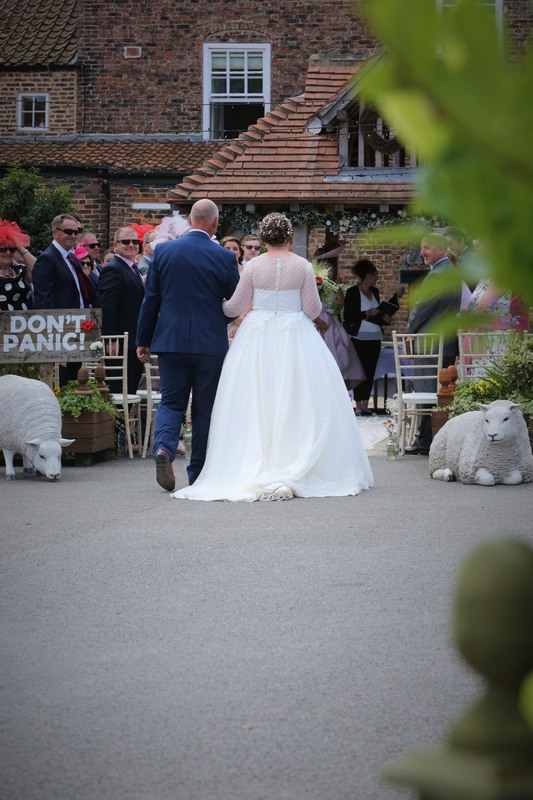 And to catch you when you slip down the other side. 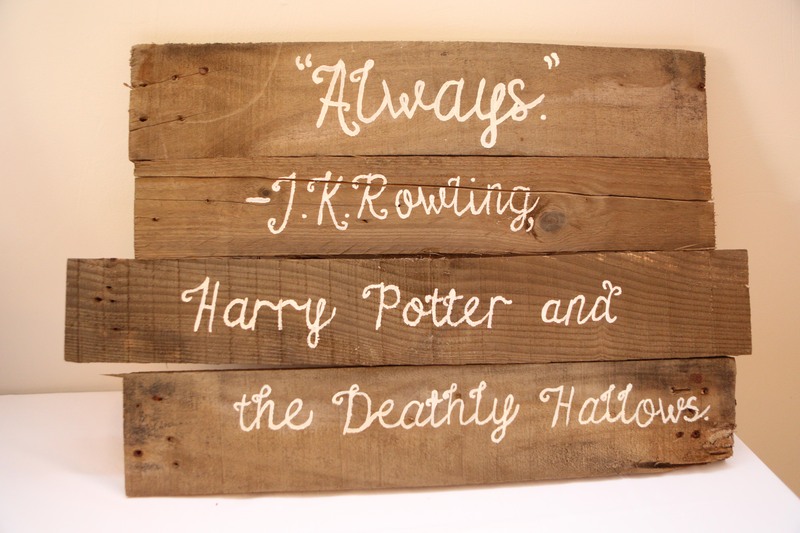 And be your strength when you need it. 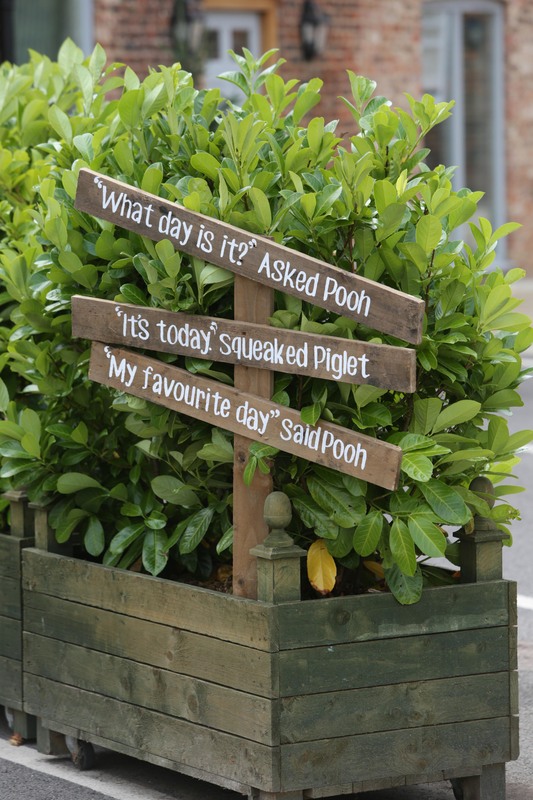 And always shoo away the ducks and jellyfish. 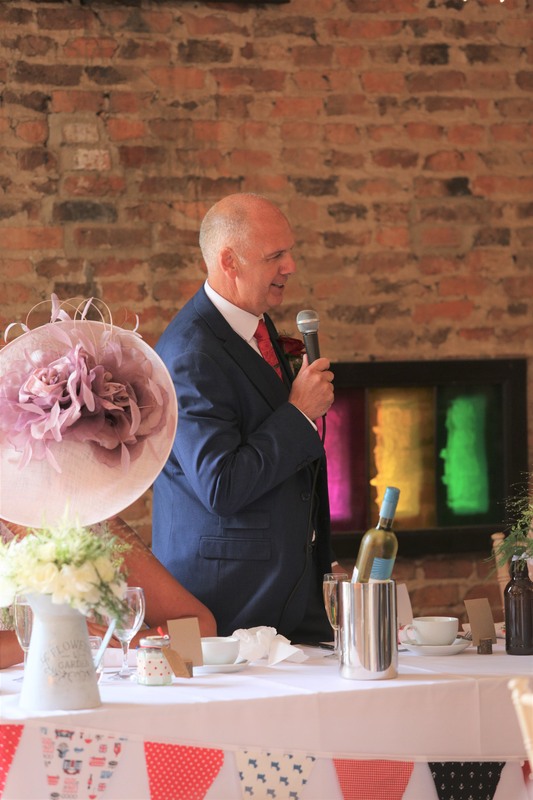 Becky’s Dads speech was very emotional and endearing for his “clever, funny, caring and beautiful daughter. 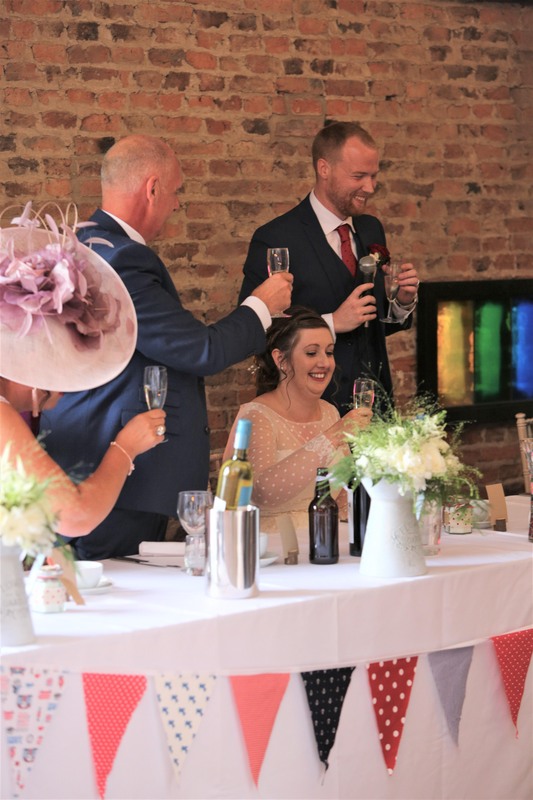 Robert made everyone giggle with a couple of jokes- “I’m not going to say this wedding is an emotional occasion but even the cake is in tiers”. 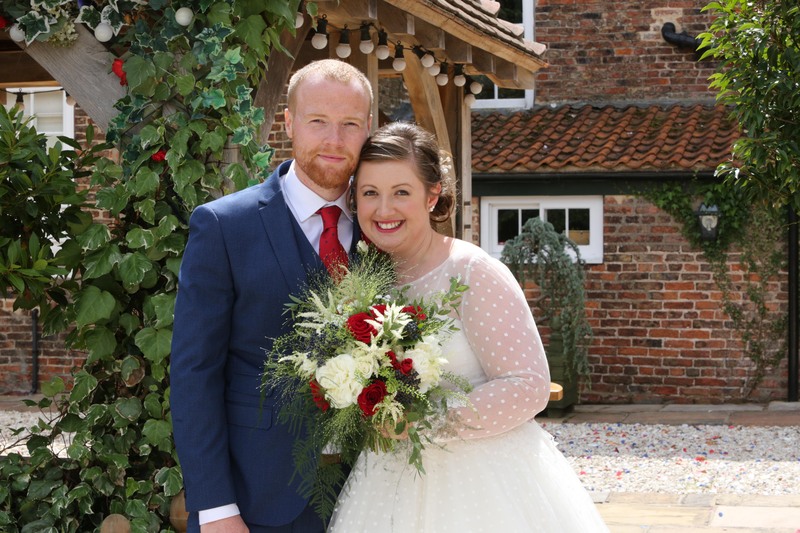 Robert spoke with pride that Becky and Paddy graduated in Carlisle and both started their careers as primary school teachers in London, but happily moved “back up North” and now have settled in Leeds. 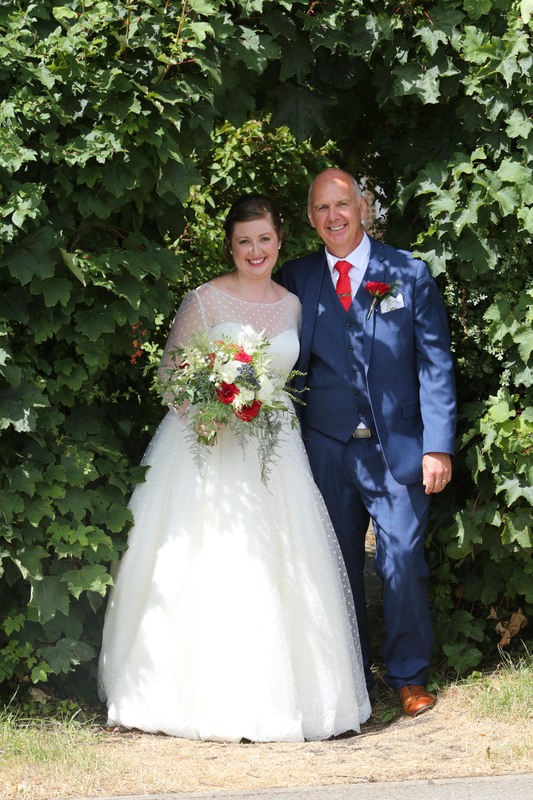 Dad reassured Becky “you will always need a helping hand and a shoulder to cry on”, “these are the hands and this is the shoulder”. 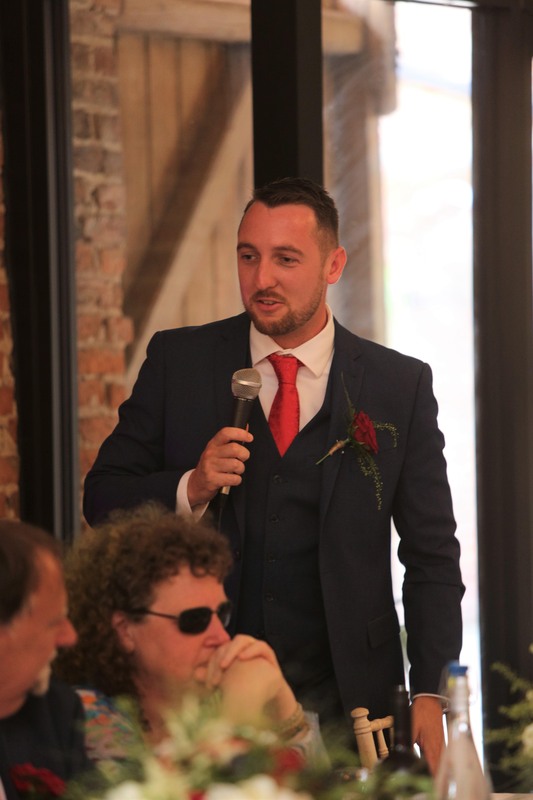 Paddy’s speech was wonderful, thanking everyone for coming especially Grandma who is 97 years old, and the most glamorous member of the Hugill family! 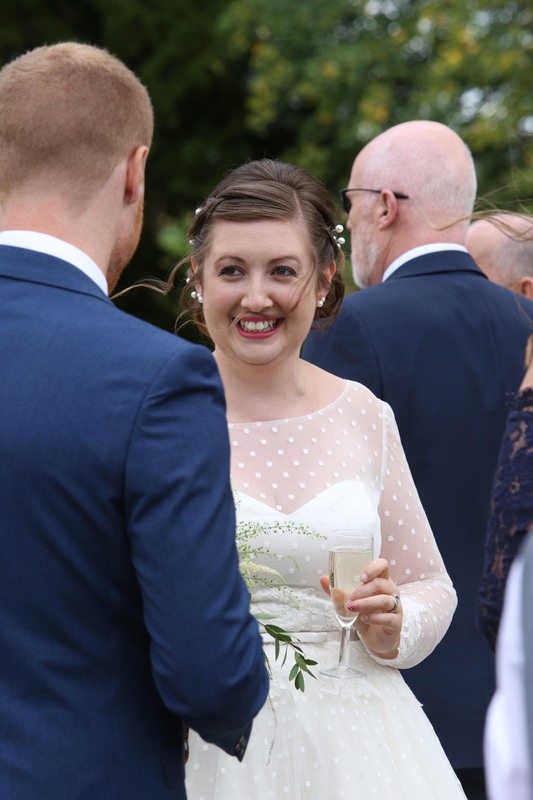 Paddy’s sister Katie, who couldn’t be at the wedding had just given birth to baby Rowen. 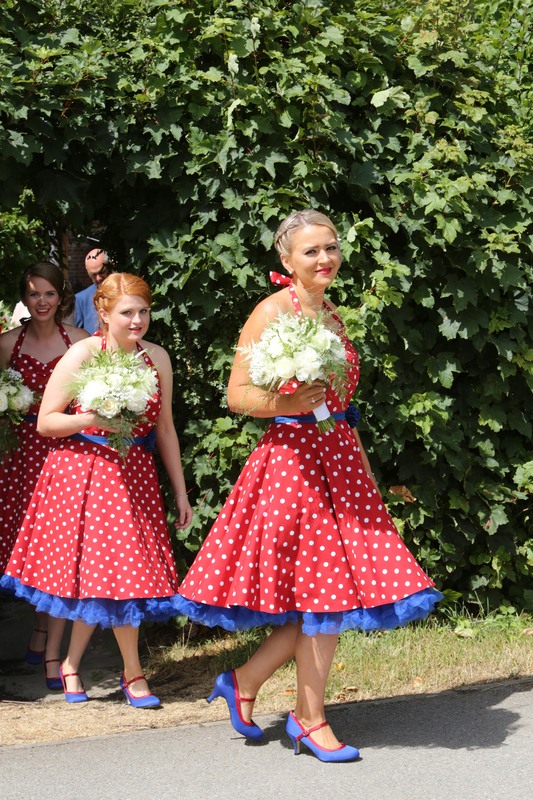 He congratulated all the ladies for hanging on to their hats, with the wind that was not an easy job. 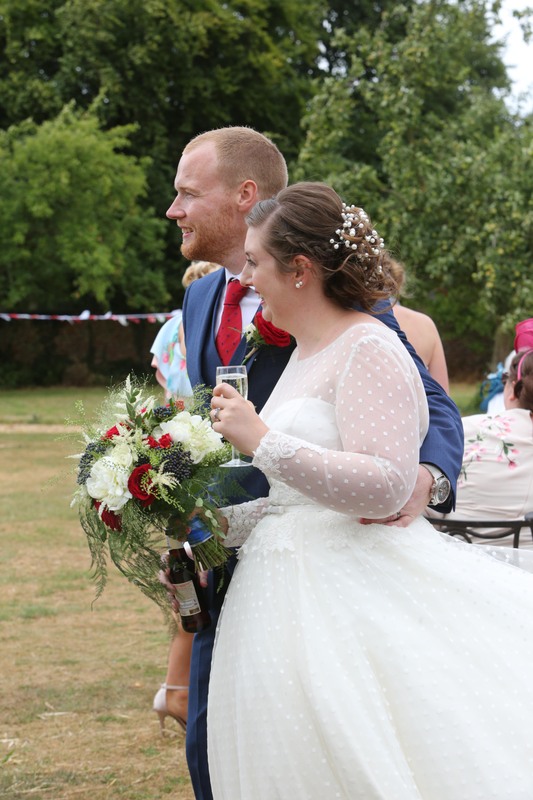 Being teachers Becky and Paddy couldn’t help working out that it had taken their guests a combined 3200 miles to come along to their wedding from Blackpool, Manchester, Finland, London and Reading. 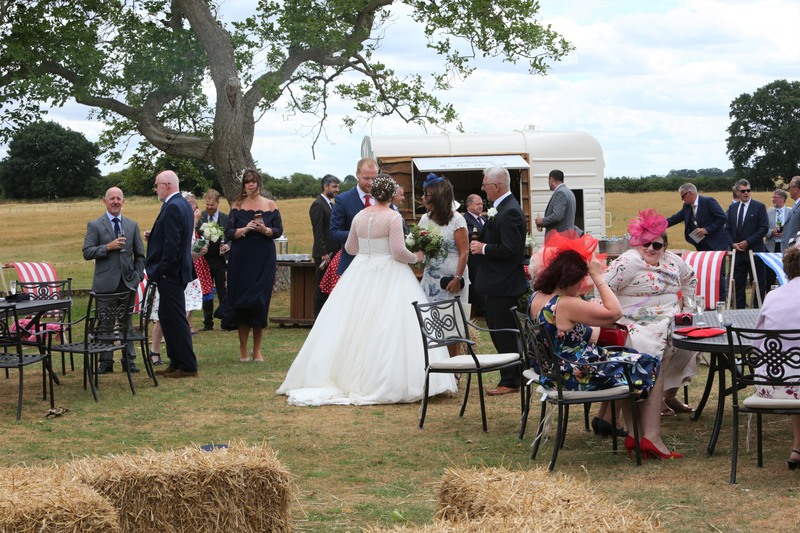 With a fabulous DJ to keep the party going and Fish and Chips to boost the energy levels for all the dancing, the happy couple said goodnight to their wonderful day, with the promise of fun and games on the lawn on Sunday. 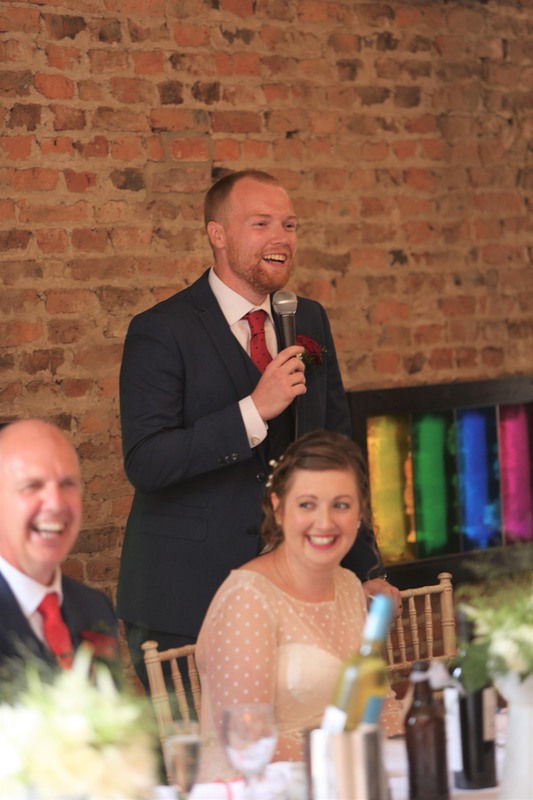 “When there’s a smile in your heart, there’s no better place to start”.